Dwyane Wade is facing off against the San Antonio Spurs for the final time in his storied career tonight. Prior to the game, Spurs head coach Gregg Popovich gifted Wade something he won’t soon forget. Keeping up with the tradition of jersey swapping that Wade has taken part of this season, the Spurs gave him signed jerseys of Spurs legends Tim Duncan, Manu Ginobli, and Tony Parker. Wade certainly knows and respects not only Popovich, but the three players who once wore the Spurs jerseys he was gifted on Wednesday night. 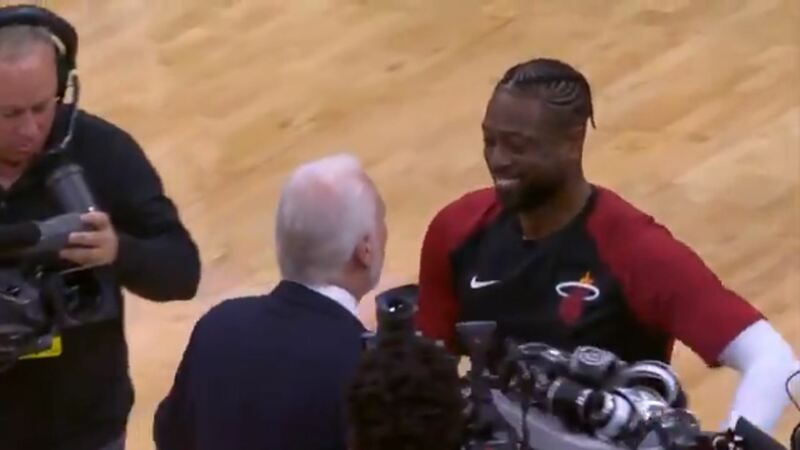 As a member of the Miami Heat during the Big 3 era, Wade defeated the Spurs in the 2013 NBA Finals and then lost to them in the 2014 NBA Finals. Regardless of old rivalries, it’s clear that the sense of respect and adoration is felt on both sides. With the number of regular season games left in Wade’s career nearing the single digits, it’ll be interesting to see if any of the teams in the upcoming matchups look to better the Spurs when it comes to parting gifts.